Owned and operated by Brenden Phillips, Vision Green Landscape is your source for all of your outdoor living needs. From hardscapes to landscapes and plant maintenance, we can handle all the tasks you need to make your outdoor living space an asset to your home. Vision Green Landscape is much more than just a company offering lawn maintenance services in Charlotte, although that is a major part of what we do. 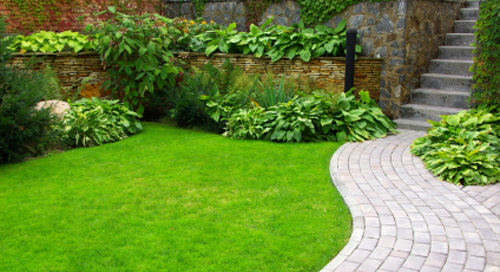 We are proud to offer a wide range of services, including landscapes, hardscapes and lawn maintenance. Of course, lawn maintenance service in Charlotte are central to our services. In addition to cutting and fertilizing, we also offer irrigation, aeration, over-seeding, and turf management. We service both residential and commercial properties, and are ready to help you have the vibrant, lush lawn you want. At Vision Green Landscape, we are committed to helping our customers see their outdoor dreams become a reality. Whether you want simple lawn maintenance services in Charlotte or are looking to create an outdoor sanctuary, you will get the same level of service and attention from our team. We guarantee that you will be satisfied with the care we provide, and have earned a reputation for quality over the years. Contact us today to learn more about our landscaping and lawn maintenance services in Charlotte.